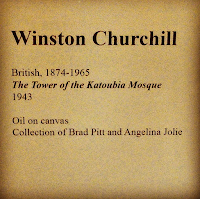 A landscape called “The Tower of the Katoubia Mosque (1943)” is reportedly the only piece that icon statesman Winston Churchill (1874-1965) painted during World War II. “In January of 1943, Churchill secretly met with President Franklin Roosevelt in Casablanca, Morocco to decide the timing of D-Day, the invasion of France,” said his Great-Grandson Duncan Sandys. “After days of tough negotiation, Churchill convinced Roosevelt to support a D-Day campaign of overwhelming force in 1944. 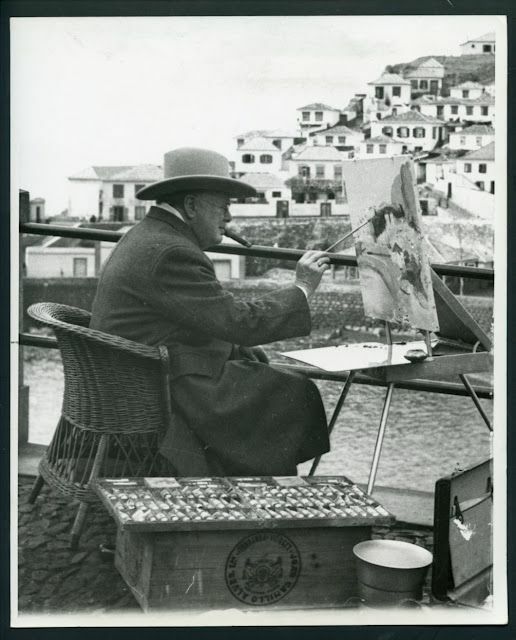 He invited Roosevelt to cement the agreement – which Churchill knew demanded a close personal friendship – over a trip to Marrakech to watch the sun set against the backdrop of the Atlas Mountains. The next day, Churchill painted the daytime view from the same spot, later giving the painting to Roosevelt,” Sandys added. in 1914 at the age of 40.
more than 500 works of art. President Roosevelt hung the painting in his Hyde Park, New York home. 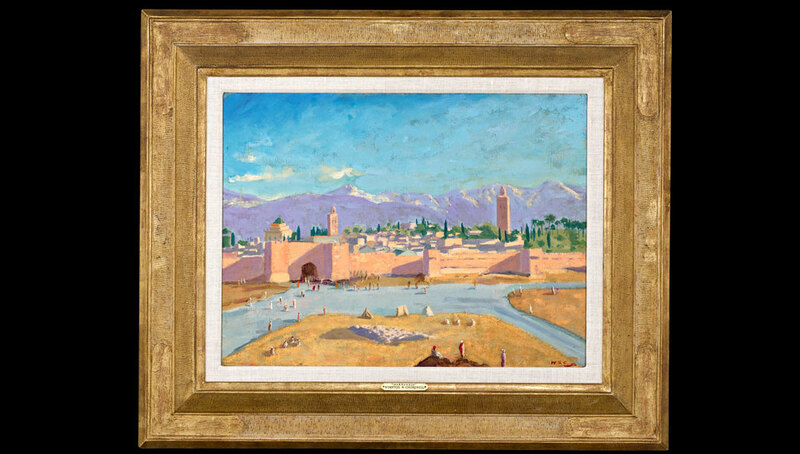 In 1950, FDRs son, Elliot Roosevelt, sold it to George W. Woodward, a Nebraska art collector. Woodward in 1964 sold it to author, movie producer, financier and art collector Norman G. Hickman, who served as associate producer of the Churchill-themed film, “The Finest Hours” in 1964. 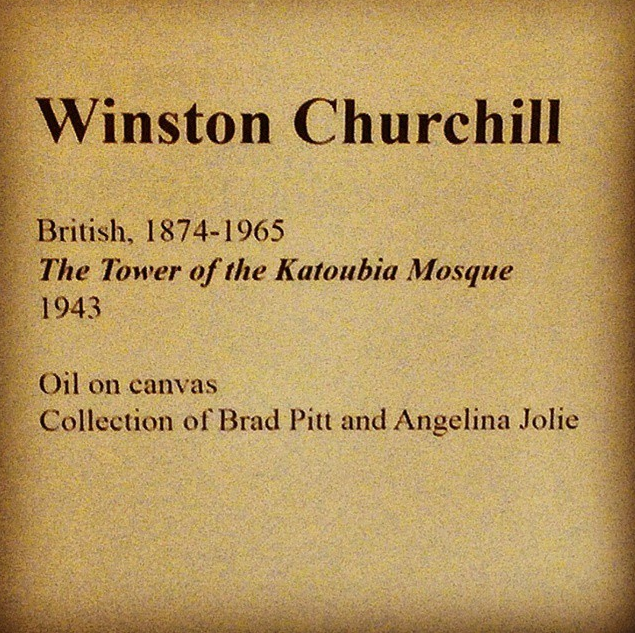 While in Hickman’s possession, “The Tower of Katoubia Mosque” was exhibited at the New York Daily News building in January, 1965 and later at the Churchill Memorial in Fulton, Missouri during the Summer of 1970. Upon Hickman’s death, it was passed to his second wife and then to her daughter, where it was stored in a closet for many years. In 2011, the painting resurfaced at M.S. Rau Antiques, where it was offered at auction for about $3 million. Actors Brad Pitt and Angelina Jolie bought the painting at auction and it remains in their private collection. In recent years, the couple separated giving rise to the question, which of them will obtain ownership of Churchill’s paintings when and if a final divorce ensues? 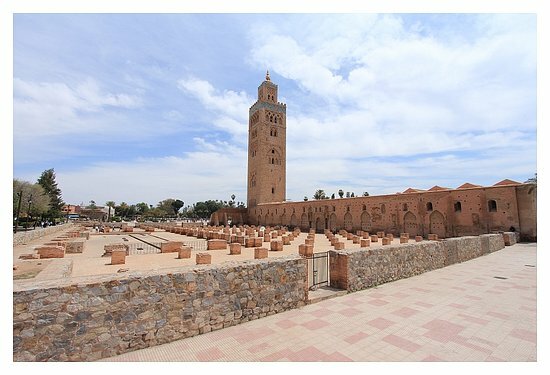 The original Katoubia mosque and minaret, Casablanca Morocco.